Today we took the train from Assisi to Perugia – the main city in Umbria and home of a treasure trove of art and history. It seems that I am always away from home on Halloween. This year I am in Italy and the past couple of years I was in or traveling to Argentina. Halloween is not really a big holiday in Italy or Argentina, although I spotted small nods to the day here and there in both places. I wanted to make sure I took time to pause and wish everyone out there a happy Halloween. My good friend Lynda is a big fan of the day, and I am so happy to know she is celebrating with her beloved niece and nephews. Lynda – who runs the Grateful Evermore blog – has held pumpkin carving parties in the past and is always doing something special for the season. One year I showed up at her house to find the coolest Halloween decoration ever – a skeleton in a coffin candelabra. I loved it! I guess I raved so much about it that Lynda made a note. One day not long after, I arrived home from work to find a package. 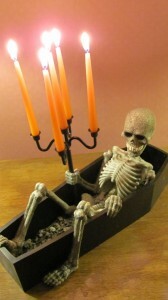 I opened it up to find my very own a skeleton in a coffin candelabra – a gift from Lynda. Knowing I would be away on Halloween this year I took my skeleton in a coffin candelabra out a little early and lit it every night for a week leading up to my trip. Thanks to Lynda and memories of Halloweens past, I got to celebrate this year even though I am so far away. So, I wish you a great day and hope you get more treats than tricks! Well, I finally made it to Italy for my annual autumn vacation. 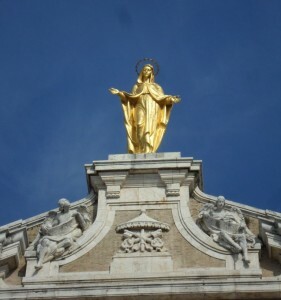 I left Boston on Friday evening, arrived in London early Saturday morning for a connecting flight to Rome that got me there around 4:00PM local time. I met up with my traveling companions (my sister and niece) who arrived separately in Rome and we jumped in the rental car for a 3-hour drive to Umbria. We arrived at a lovely villa just outside of Assisi in the mountains of central Italy around 10:00PM and after a quick dinner we all crashed. Today was our first real day of he vacation and we spent it scoping out the local surroundings around the holy hilltop town of Assisi. I am collecting notes and “finds” from all of my travels around Italy – so watch for many more details in the coming days. There is nothing like a really creepy movie to get you in the Halloween mood. I like slow-paced spooky thrillers as opposed to the gory horror-fests that seem to be all the rage today. But the scariest movie I have ever seen is “Burnt Offerings” which I saw on television as a small child. I have never seen the movie since, as I am afraid to, so I can’t tell you if it holds up. But I am guessing a film from 1976 does not play well with present day sensibilities. But there is something about the impression a film can have on you as a child that you carry through your life. Anyway, watching something spooky with all the lights out is a fun way to spend a Halloween weekend evening. Boo! Nothing says autumn and Halloween more than a good candied apple. Thanks again to Lynda over at Grateful Evermore, we have been turned on the “gourmet apple” treats of the Sassy Apple. 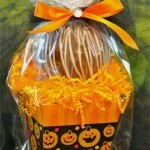 The Sassy Apple offers apple treats all year, however, their classic apple “set in an adorable pumpkin box” is perfect for Halloween giving. After visiting the Sassy Apple, you may be inspired to enjoy candied apples on other holidays or whenever you need a special treat. See the “gourmet apple” treats of the Sassy Apple here. With Halloween just days away we wanted to give a shout out to our favorite candy: Twizzlers! 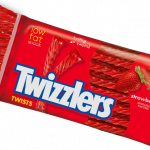 We love Twizzlers, not the cherry, chocolate or other varieties the brand has played around with in the past few years, but the original strawberry twists. The good folks at Hershey’s, who make Twizzlers, package little fun sized servings of Twizzlers which are perfect for Trick-or-Treaters, or for a snack any time. According to the official Twizzlers website, it takes approximately 15 hours to make a batch of Twizzlers. I can assure you that no Twizzler has ever lasted that long in my possession. Fair warning – any house giving out Twizzlers on Halloween will be visited early and often. Yikes! 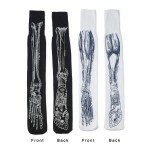 Forget all that, these socks are perfect to use as a lazy man’s Halloween costume. I imagine wearing these under my suit pants in the office and pulling up my pant leg during a boring meeting. But a nice foot massage sounds good too. See all the fun and cool products and gift ideas Uncommon Goods offer here. 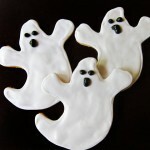 Thanks to our good buddy Lynda over at her blog, Grateful Evermore, for turning us on to this Halloween find: the gorgeous Ghost Cookies from the Piece de Resistance. We just think they look yummy! 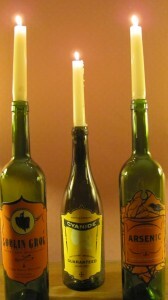 See the Piece de Resistance’s etsy shop here. A week from now I will be somewhere in the Italian countryside looking for a place to press my own olives. I will be in Italy for about ten days – mostly in Umbria – but my travels will take me to Rome, Florence and a few other great cities. Unfortunately, Venice is not on the agenda for this trip – although my sister with whom I will be traveling thinks we should try. 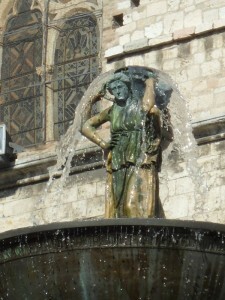 Like so many, I have always been fascinated by Venice and love reading about it and seeing it in pictures and films. Thus, I was attracted to the book The City of Falling Angels by John Berendt, a skillfully observed portrait of Venice and its inhabitants. Mr. Berendt is best know as the author of the extremely popular Midnight in the Garden of Good and Evil where he wrote about the city of Savannah, GA and its colorful inhabitants. Mr. Berendt is an a very engaging writer, and like he did in his first book, he creates a world so interesting and colorful in The City of Falling Angels that you feel like you have lived in Venice all of your life. At the heart of the book is the story behind a fire that destroyed the Fenice opera house. In my mind opera and Venice go together and Mr. Berendt explores this story with all the drama and grandeur of the greatest Italian arias. I read this book when it first came out a couple of years ago, but I took it off my shelf recently and sat down and re-read most of it. In addition to remembering how much I enjoyed reading the book the first time, I was overcome with memories of where I was when I first read the book. I recalled a summer of biking and stopping to rest and pulling out this book. Like a song from the past that can bring you back to a certain place and time – so can a great book. 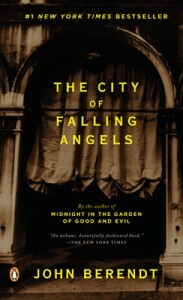 The City of Falling Angels is available from Amazon and other booksellers. 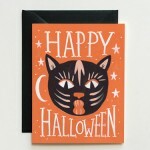 HALLOWEEN QUICK HIT: The Black Cat Halloween card from the Rifle Paper Co. I love the stationary and paper goods of the Rifle Paper Co. in general, but this week, I love their Black Cat Halloween Card. The card, described as “inspired by vintage Halloween cat masks and old posters” comes with a cool yet totally impractical matching black envelope. See this cool card and all the great products of the Rifle Paper Co. here. Lost Cowboy is powered by	WordPress 5.0.4 and delivered to you in 2.043 seconds using 61 queries.